A shiny new Pierce Arrow thundered down Fredericksburg's Main Street, shattering the silence of a quiet morning, scattering chickens like leaves in the wind and scaring half to death a string of saddle horses tied to the hitching post at the Buckhorn Saloon at the corner of Main and Crockett Streets. Cars were new to Gillespie County in 1910. Playthings for the wealthy. Good for terrifying livestock and little else. Fredericksburg, Texas was still a horse and buggy town. The daredevil behind the wheel was a wealthy and important man although he was no typical big shot in this close-knit conservative German community. He was an auslander who spoke little German, an Episcopalian and a Democrat. To escape the Texas heat he and his family regularly summered in, of all places, New York City. Temple Doswell Smith, Banker Smith as he was known in these parts, was born on August 22, 1846 at Walnut Hill Plantation in Hanover County, Virginia. After graduating from the University of Virginia, Smith worked for an Indianapolis hardware company and a New York financial house. He married Mary Alice Francis, an Indiana girl. Smith came to Texas in 1884 to join his brother Frank in the mercantile business in Anson. The brothers founded the first bank in Jones County. Temple Smith was smooth and ambitious. He oozed charm and confidence. His optimism could lift the spirits of an entire town. One day a tornado leveled part of Anson, including the Smith Brothers building, scattering dry goods all the way to the Clear Fork of the Brazos. Temple Smith had every reason to be down in the dumps. Instead, he and Frank cleared the debris from the bare wood floor where the store once stood and held a dance that lasted until sunup. On a business trip to San Antonio, Temple Smith heard of a prosperous village in the Hill Country that had no bank. Smith visited Fredericksburg, liked what he saw and decided to stay. In 1887 Temple Smith founded the Bank of Fredericksburg, located on the first floor in the Maier Building at the corner of Main and Adams (today Hudson and Taylor). Frontier banking could be an adventure. On July 2, 1888, two strangers entered the bank, guns drawn. One stranger got the drop on Banker Smith and his assistant Mr. Wahrmund, The other bandit scooped up $250 in cash from the teller's drawer. They wanted more but the timed vault was locked and couldn't be opened until the next morning. The bandits ran out into the street, leaped into the saddle and galloped to the west across the public square. Smith and Wahrmund ran upstairs to the law office of Judge A. O. Cooley. They took shots at the bandits from a second floor window until the outlaws made the brush and vanished. In 1889 Smith commissioned renowned San Antonio architect Alfred Giles to build a new bank building at 210 E. Main Street. The bank was on the first floor. Smith and his family lived on the second floor. 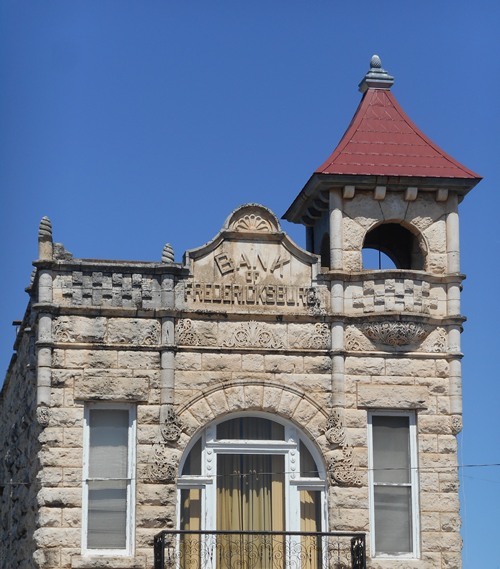 Quite a few banks defaulted during the Panic of 1907, but the Bank of Fredericksburg, along with two other East Texas banks run by Banker Smith, weathered the crisis without closing doors or limiting withdrawals. The San Antonio Light called Banker Smith's amazing work during the Panic "a unique feat." "It is probable," the Light reported, "that this performance was not duplicated by any other individual banker in the United States." Fredericksburg believed in Banker Smith. His word was gospel. He got things done. Banker Smith is best remembered as the driving force behind the Fredericksburg Railroad. He spent years of his life and a considerable part of his wealth, bringing the railroad to town. The railroad honored Banker Smith by naming a stop after him. The town of Bankersmith, two miles south of Grapetown, once had a depot, post office, store, lumberyard, garage and dancehall. Temple Smith died on April 24, 1926. The Bank of Fredericksburg did not survive the Depression. In February 1932 both Fredericksburg banks failed on the same day. "The Fredericksburg Railroad Viewed As A Paying Proposition," San Antonio Light, November 16, 1913. "The Bank of Fredericksburg," Fredericksburg Standard, May 1, 1946. "Fredericksburg Banker Has Used Pierce-Arrow Cars Fourteen Years," San Antonio Express, November 16, 1924. "The Brownwood Press Meeting," The Anson Western-Enterprise, June 17, 1937. "Wm. H. Hollis, Member of the County's Fifty Year Club, Attended Original Cowboy's Christmas Ball Here, 1885," The Anson Western-Enterprise, September 28, 1939. Temple Doswell Smith, The Handbook of Texas.